Be the first robot to intentionally push a bottle off the table OR be the last robot remaining on the table. Senior Unlimited: 9th ~ 12th Grade: Any platform and programming language. Senior Classic: 9th ~ 12th Grade: LEGO EV3, LEGO NXT and VEX IQ platforms. Junior: 5th ~ 8th Grade: LEGO EV3, LEGO NXT and VEX IQ platforms. New size and weight requirements for 2019 season! 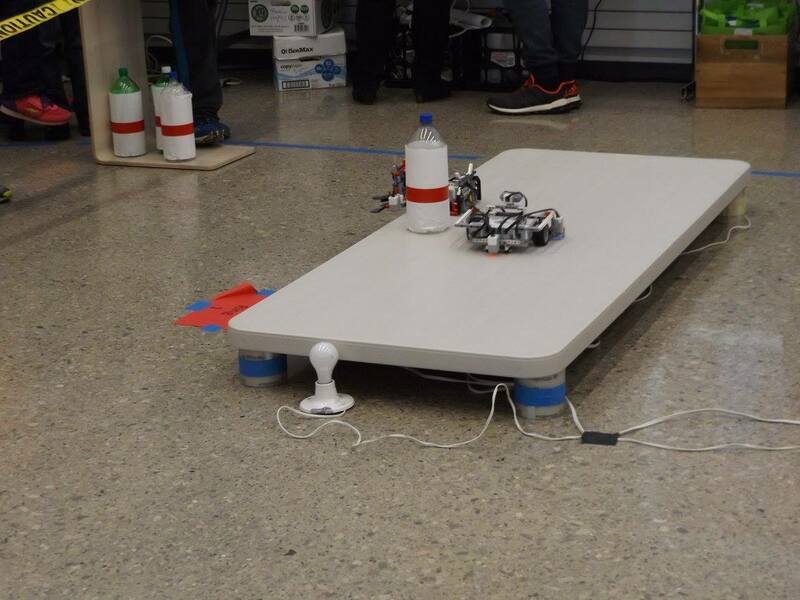 Junior and Senior Classic teams will have chances to compete at various local sites, and all divisions will meet in May 2019 at the Robofest World Championship on the campus of Lawrence Technological University in Southfield, Michigan. This is an Open category - each event stands alone with no advancement. Winners at local site must register again if they wish to compete at the World Championship event on May 16th-18th. Each team member, as well as the coach and other adult volunteers, must bring the signed Robofest Consent and Release Form on the day of the event if not completed on line. Registration will open on April 1, 2019 for World Championship Open BottleSumo Competitions. Senior teams will compete in the Classic or Unlimited Divisions on Friday, May 18, 2019. Junior teams have the choice to compete on Thursday, May 16 or Friday, May 17, 2019. The winning team from each Junior group will face off for the championship title at noon on Saturday, May 18, 2019. Please visit the World Championship page for more information.